What are the odds that a new fiction show, launched by one of the leading Hindi GECs, will enter the list of Top 5 programmes within its first 6-12 months? If you look at the chart below, you wouldn’t want to place a bet on that. This simple analysis of the Top 5 Hindi GEC fiction shows of the year, over the last six years, has a lot to reveal. 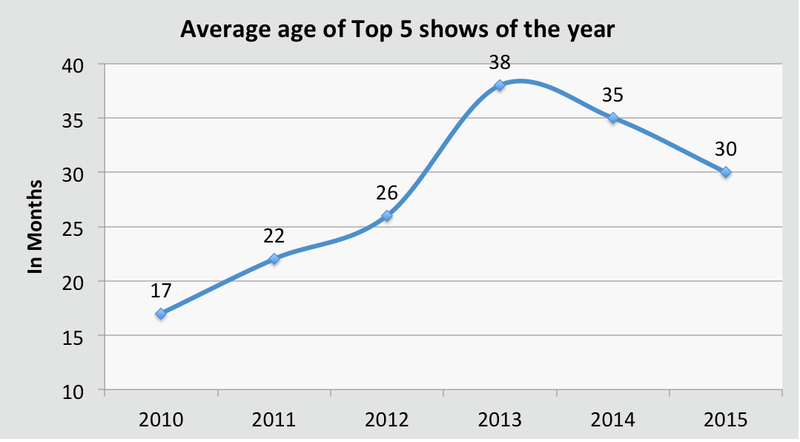 The average age of the Top 5 shows (defined as the number of months the show was on-air, counted at the middle of each year, i.e., end June) is currently at 30 months. Yes, that’s two-and-a-half years! As you can see, 2013 was a watershed year, when the average age increased by a full year, from 26 months to 38 months, which could be interpreted as largely the same shows being the Top 5 in both these years (three of the five were indeed the same). The years 2010 and 2011 were very different in nature. These came in the aftermath of the shake up that Colors brought with it, reaching No. 1 in 2009, before Star Plus made an astounding comeback with ‘Rishta Wohi Soch Nayi’ in 2010. The two channels dominated the ratings landscape, and most shows that topped the charts in 2010-11 were 2009-11 launches. What number should a broadcaster be happy with? Is an average age of 17-22 months preferred over an average age of 35-38 months? It can be argued that a broadcaster who’s doing well and has a loyal viewer base (e.g. Star Plus) would benefit from a higher-average-age trend. It would indicate consumer inertia to shift from their favorites, and that should suit the leading channel well. Also, a lower average age would mean that shelf life of programmes is reducing, which, in turn, would imply that channels would have to launch more programmes every years, which in turn means costs of content development, marketing and research will go up. But most channels are not leaders with a big loyal base, and average shelf life of new shows is determined largely by flop shows than by hit shows, and has remained largely constant at about 12 months over the last few years (which means that for every show that goes on for five years, there are at least half a dozen others that end within a year). Any growing industry would aspire to bring the average age down. 30-38 months is simply too old for comfort. 12-18 months should be a good number, reflective of an audience taste that balances loyalty and novelty. The implications of the average age having gone up can be significant, especially for broadcasters challenging the big three at the top. Converting a viewer who’s 2.5 years into a show is a tough ask. A 30+ months stat reveals an audience mindset that’s largely rejecting new content. As has been mentioned in this column before, it’s a reflection of their cynicism that new content largely flatters to deceive. Colors has managed to do well in recent times, with shows like Ashoka and Meri Aashiqui Tumse Hi bucking the trend of old horses driving success. That’s one of the reasons we have seen an improvement from 38 months to 30 months over the last two years. But we need a lot more. The category may have got eight months younger, but it is simply not young enough. The answer lies in content innovation. But that’s another topic, for another day. This entry was posted in Hindi GECs. Bookmark the permalink.